Here, we describe a protocol based on epigenetic reprogramming of human embryonic stem cells (hESCs) toward generating a homogeneous population of skeletal muscle progenitors that under permissive culture conditions form three-dimensional clusters of contractile myofibers (myospheres), which recapitulate biological features of human skeletal muscles. Albini, S., Puri, P. L. Generation of Myospheres From hESCs by Epigenetic Reprogramming. J. Vis. Exp. (88), e51243, doi:10.3791/51243 (2014). Generation of a homogeneous and abundant population of skeletal muscle cells from human embryonic stem cells (hESCs) is a requirement for cell-based therapies and for a "disease in a dish" model of human neuromuscular diseases. Major hurdles, such as low abundance and heterogeneity of the population of interest, as well as a lack of protocols for the formation of three-dimensional contractile structures, have limited the applications of stem cells for neuromuscular disorders. We have designed a protocol that overcomes these limits by ectopic introduction of defined factors in hESCs - the muscle determination factor MyoD and SWI/SNF chromatin remodeling complex component BAF60C - that are able to reprogram hESCs into skeletal muscle cells. Here we describe the protocol established to generate hESC-derived myoblasts and promote their clustering into tridimensional miniaturized structures (myospheres) that functionally mimic miniaturized skeletal muscles7. Because of their unique ability to self-renew while retaining pluripotency, human embryonic stem cells (hESCs) are considered an invaluable resource in regenerative medicine. Stem cell mediated repopulation of diseased muscles and hESC- or induced pluripotent stem cells (iPSC)-derived generation of skeletal muscles for in vitro disease modeling are key goals of studies aimed at identifying treatments and elucidating the pathogenesis of many neuromuscular diseases. However, these studies have been challenged by the resistance of hESCs to convert into skeletal muscle cells and by the paucity of information regarding the molecular regulation of hESC-commitment toward skeletal myogenesis. Indeed, previous attempts to generate skeletal muscle progenitors from hESCs revealed that only embryoid body (EB)-derived progenies or mesenchymal cells are competent to activate skeletal myogenesis following ectopic expression of transcriptional activators (e.g. Pax3 or Myf5)1-3 or by exposure to specific culture conditions4-5. This protocol requires high titer lentiviruses encoding BAF60C and MyoD13. These constructs are available upon request. In order to ensure high efficiency of infection, plate hESCs for infection on feeder-free conditions (Figure 2A) to eliminate cellular competitors during the viral uptake. Indeed, MEFs are notoriously easier to infect as compared to hESCs and are competent for MyoD-mediated conversion. Thus, eliminating MEFs from hESC cultures increases the infection rate. It is recommended to have high titer lentiviruses to ensure high efficiency of infection. Options to improve efficiency of infection are discussed in the section "checking infection". Prepare matrigel-coated plates by adding 1 ml of 1 mg/ml Matrigel in each well and leave at least 1 hr at RT (or O/N sealed at 4 °C if prepared the day before). Add hES Cell Cloning & Recovery Supplement in the medium at 1,000X dilution (2 mM final concentration). Note: Perform the infection of hESCs with BAF60C first followed by infection with MyoD. Dissociate a well of a 6-well plate of hESCs grown as colonies14 in a single-cell suspension by incubation with 1 ml of TrypLE for 5 min at 37 °C. Transfer suspension to a 15-ml tube, add 9 ml of hESC medium and centrifuge for 5 min at 1,200 rpm. During the centrifugation, prepare the infection mix in a clean tube by adding to 1 ml of mTeSR1, polybrene (6 mg/ml) and hES Cell Cloning & Recovery Supplement (2 mM). Re-suspend the cell pellet (approximately 5 x 105-1 x 106 cells from one confluent well of hESCs) with 1 ml of infection mix and plate onto a 6-well low attachment plate, which prevents the cells from adhering to the plastic. Collect the cell suspension containing the viruses and divide equally in two matrigel-coated wells. Then add 2 ml of mTeSR1+ hES Cell Cloning & Recovery Supplement to each well and leave O/N in the incubator. Carefully remove the medium containing the virus and replace with 2 ml of mTeSR1and hES Cell Cloning & Recovery Supplement. Cells will start clumping as shown in Figure 2B. Before proceeding check the fluorescence status of the cells under a fluorescence microscope to make sure to have a high efficiency of infection. If not, see the section "checking infection". If the cells have reached at least 80% of confluence, proceed as follows; otherwise wait for an additional day prior to proceeding. Remove the medium and add 1 ml of TrypLE reagent to dissociate the cells. Incubate 5 min at 37 °C. Repeat as described from1.2.2.2 - 1.2.2.6 adding MyoD virus at 108 MOI. Carefully remove the medium containing the virus and replace with 2 ml of mTeSR1and hES Cell Cloning & Recovery Supplement. Plate MEFs on matrigel coated plates at 2.5 x 105/cm2 for the next day to allow propagation of the infected cells. Transfer the cells in a 15-ml falcon tube, add 9 ml of hESC medium and centrifuge for 5 min at 1,200 rpm. Remove the supernatant and re-suspend in 6 ml of hESC medium. Remove the medium from the MEFs-containing 6-well plate and plate hESCs at 1:2 split ratio, dispensing 3 ml for each MEFs-containing well. Remove the medium and incubate with 1 ml of 1 mg/ml collagenase IV for 5 min at 37 °C. Remove collagenase IV and add 1 ml of hESC medium. Under a dissection microscope scrape the colonies with a 10 ml tip. Collect the chunks of colonies in a 15-ml tube and allow to sediment for 3 min. Then remove the supernatant, resuspend in hESC medium and plate on MEFs plates using a ratio 1:4. While propagating the cells, it is recommended to plate the infected cells in a smaller scale to harvest for RNA analysis and perform protein expression analysis by immunofluorescence in order to check for biomarkers that reflect the correct biological status at each stage (see Representative results). For high titer lentiviruses the percentage of expected infected cells should be at least 80%. To ensure high efficiency, the lentiviral vectors can be modified, introducing a fluorescent selection marker and/or an antibiotic resistance. Our lentiviral plasmid expressing BAF60C also carries GFP fluorescence. Sorting hESCs for a fluorescent marker. In the case of low efficiency of infection is recommended to use fluorescence activated cells sorting (FACS-sorting) to enrich for cells expressing BAF60C virus and then infect the cells with high titer MyoD virus. Add hES Cell Cloning & Recovery Supplement in the medium the day before the sorting. The day of the sorting, dissociate the cells by TrypLE (as described at day 0) and resuspend the cells in KO replacement serum plus hES Cell Cloning & Recovery Supplement in FACS-tubes. At the end of the sorting, collect the cells in KO replacement serum and plate on MEFs plates adding hES Cell Cloning & Recovery Supplement. Make sure, before starting differentiation from BAF60C/Myod-infected hESCs, to have high number of colonies in the well (Figure 2C). For each well remove the medium, wash with PBS and add 1 ml of 1 mg/ml collagenase IV. Incubate for 5 min at 37 °C. Remove collagenase and add 1 ml of EB medium. Under a dissection microscope quickly mechanically dissociate the colonies into 400-800 cell aggregates by scraping with a 10-ml tip. Collect the chunks of colonies in a 15-ml tube and allow to sediment for 3 min. Remove the supernatant, re-suspend in 3 ml of EB medium and transfer the cell suspension to one well of a 6-well low attachment plate. Check the size of colonies and the cell death before proceeding. If big chunks are present, break them by gently pipetting up and down with a 5-ml pipette, 3-4 times. If the cell death is very high (many floating cells and debris) replace the medium by collecting the aggregates in a 15-ml tube by gravity and plate them with 3 ml of fresh EB medium, otherwise proceed as follows. Change the medium by collecting the aggregates from the wells in a 15-ml tube. Let them settle down for 2 min. Remove the supernatant, replace with 3 ml of fresh EB medium and redistribute on the same wells. Add 1.5 ml of fresh EB medium in the wells. Proceed as described in "Day 2". Day 5 - Myogenic differentiation of EB-like clusters (Figure 2D). Collect the aggregates as described in 2.1.3.1 and wash once with 2 ml of PBS; allow the aggregated to sediment. Remove PBS and add 3 ml of DM medium; plate on the same wells. From d6 to d20 replace the medium with fresh medium every 3 days. Representative myospheres are shown in Figure 2E. Before proceeding further, it is recommended to check the efficiency of myogenic differentiation within the myospheres by making sections of the myospheres embedded in O.C.T. compound, as described in a previous JoVE protocol12. Perform an immunofluorescence staining for myogenic markers such as myognenin (clone F5D, DSHB) and myosin heavy chain (clone MF20, DSHB) (see Representative results). TIP! To be successful with the staining for myogenin on EB sections it is critical to perform antigen retrieval by treatment with sodium dodecyl sulfate (SDS) 0.5% for 5 min. Additionally, it is possible to use this protocol for the double staining using F5D and MF20 antibodies. Figure 1A shows a schematic of the protocol proposed to generate myospheres from hESCs. The critical steps to control (indicated by the arrows) are the efficiency of the infection in hESCs and the myogenic conversion within the myospheres. In our experiments we take advantage of a lentiviral vector encoding BAF60C that carries GFP fluorescence. We usually infect the cells with BAF60C and FACS-sort 72 hr after the infection to enrich for the population expressing BAF60C. When the cells reach around 70-80% of confluence, we infect with MyoD lentivirus. After the first infection it normally takes two or three days for the cells to reach that confluence. Figure 1B shows expression levels of the exogenous genes as fold induction relative to hESCs not infected. Figure 1C shows the expression and distribution at the protein level of the factors introduced. BAF60C expression is shown as GFP fluorescence, while MyoD expression is detected by immunofluorescence with a MyoD antibody. We consider Day 0 the day we start the differentiation of infected hESCs into EB-like aggregates. After 15 days in DM medium, a portion of the myospheres (usually one entire well) is embedded in O.C.T. compound12 and sectioned to perform immunofluorescence for myogenic markers to check myogenic conversion efficiency. Figure 1D shows representative staining for myogenin and myosin heavy chain in an optimal myogenic differentiation. Myospheres can have different or unusual shapes, perhaps as a result of fusion with smaller myospheres. Starting from Day 10, it is possible to observe sporadic contraction in the myospheres (see movie 1 and 2). Figure 1. A) Schematic of the protocol used for the generation of myospheres from hESCs. B) mRNA levels of the exogenous genes in hESCs infected with BAF60C and MyoD (H9-BM) monitored by qRT-PCR and expressed as fold induction, as compared to mock infected hESCs (H9-ctr). C) Immunofluorescence images showing MyoD staining (red) and BAF60C fluorescence (green) due to the IRES-GFP element in the vector. D) Immunofluorescence performed on myosphere sections stained for Myogenin (MYOG), Myosin Heavy Chain (MyHC) and counterstained for DAPI (see Immunofluorescence details). Scale bar is 100 µm. Figure 2. Representative pictures of cell appearance at different stages of the protocol from the infection (part I) to the differentiation (part II). Scale bar is 100 µm. Whereas EB-like structures from d1 to d5 are mostly circular in shape (D), myospheres grown over 15 days according the scheme in Figure 1A present an unpredictable shape and are heterogeneous in culture; see two examples in E and F.
The protocol proposed here describes how to generate three-dimensional clusters of contractile myofibers (myospheres) directly from hESCs. The strategy proposed has the unprecedented and extraordinary potential to produce mini muscles in suspension that can be suitable as a "disease in a dish" model for both screening assays and developmental studies. Moreover, the method to generate myospheres from hESCs is straightforward and does not require any FACS-sorting step during the differentiation, which typically has a negative impact on the yield of cells recovered. Besides, a sorting procedure during the differentiation would interfere with the aggregation since it implies a dissociation of the EB into single cells. The method proposed is based on the epigenetic reprograming of hESCs with specific factors, MyoD and BaAF60C, which are not expressed in pluripotent embryonic stem cells. MyoD and BAF60C provide the "core" protein complex that marks the genomic loci from which transcription proceeds to activate the skeletal myogenic program. The two factors are delivered to the cells by means of lentiviral infections and it is therefore critical to obtain a high efficiency of infection of both factors in all cells. This can be achieved by using high titer viruses or viruses endowed with selection markers. Culture conditions also play an important role in optimizing the extent of the myogenic differentiation. 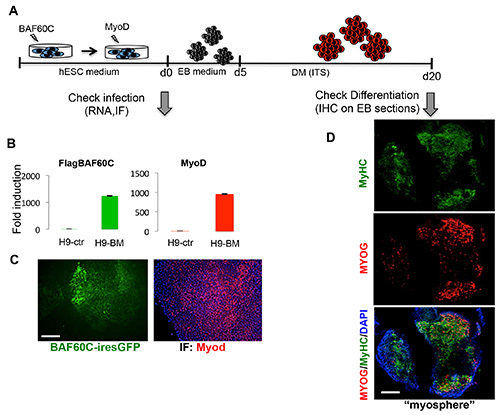 We propose a serum-based differentiation protocol for the differentiation of MyoD/BAF60C expressing hESCs into clusters of myogenic precursors, followed by incubation in serum-free defined medium (containing insulin transferrin - ITS) to achieve conversion of myogenic precursors into skeletal myotubes. However, it is possible that other defined media can achieve an equal or better myogenic differentiation. One current limitation of the protocol is that it relies on the use of fetal bovine serum, which, besides containing many animal proteins and substances, shows lot-to-lot variations. This may result in lower efficiency or heterogeneity of myogenic conversion within myospheres. Of note, not all the EB-like structures derived from BAF60/MyoD-expressing hESCs are myospheres; namely, some are EB-like aggregates fully composed of myofibers. 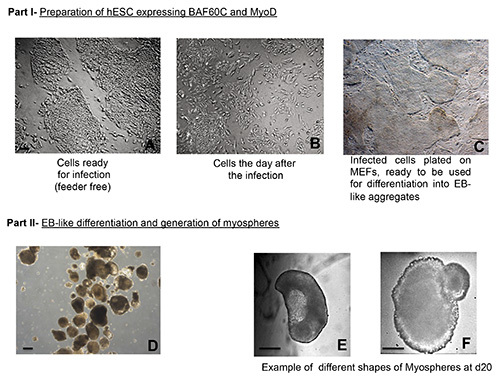 The number of myospheres normally derived from hESCs expressing BAF60C and MyoD can vary from 30 to 60% as estimated by immunostaining on EB sections performed at the end of the protocol (see Results). A potential approach to enrich a culture dish for only myospheres would be to use a myogenic reporter. This would facilitate discarding the partially or not differentiated EB-like clusters and selecting only the myospheres. Lastly, a better understanding of the mechanisms underlying the temporal requirements of the factors introduced would be useful to improve the method of delivery. For example, if BAF60C and MyoD are required only for short time to "kick" the cells in the right direction, methods based on modified mRNA delivery might be applied. By contrast, if the factors are required for a longer time before the cells exploit their endogenous proteins, an episomal approach would be recommended to eliminate variability and uncontrolled effects due to integration in the genome. Finally, we note that it is mandatory to express BAF60C prior to or at the same time as MyoD (never after) in order to achieve hESC conversion into skeletal muscles. The requirement for prior expression of BAF60C presumably relies on its role in pre-setting the epigenetic landscape for proper MyoD chromatin distribution through the genome6,15. As such, future protocols might be improved by compounds or other manipulations that promote BAF60C expression in hESCs. PLP is an Associate Investigator of Sanford Children's Health Research Center. This work has been supported by the following grants to PLP: R01AR056712, R01AR052779 and P30 AR061303 from the National Institute of Health/National Institute of Arthritis and Musculoskeletal and Skin Diseases (NIAMS), MDA and Sanford Children Health Research award. This work has partly benefited from research funding from the European Community's Seventh Framework Programme in the project FP7-Health - 2009 ENDOSTEM 241440 (Activation of vasculature associated stem cells and muscle stem cells for the repair and maintenance of muscle tissue). SA was supported by CIRM fellowship. Darabi, R., et al. Functional skeletal muscle regeneration from differentiating embryonic stem cells. Nat Med. 14, 134-143 (2008). Darabi, R., et al. Human ES- and iPS-derived myogenic progenitors restore DYSTROPHIN and improve contractility upon transplantation in dystrophic mice. Cell Stem Cell. 10, 610-619 (2012). Iacovino, M., et al. Inducible cassette exchange: a rapid and efficient system enabling conditional gene expression in embryonic stem and primary cells. Stem Cells. 29, 1580-1588 (2011). Barberi, T., et al. Derivation of engraftable skeletal myoblasts from human embryonic stem cells. Nat Med. 13, 642-648 (2007). Goudenege, S., et al. 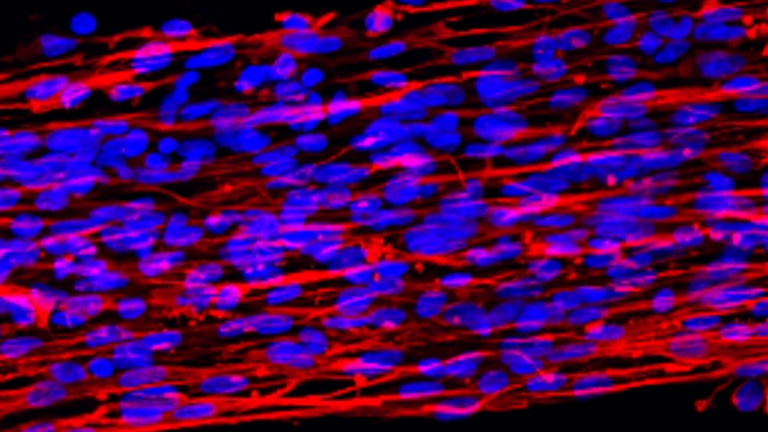 Myoblasts derived from normal hESCs and dystrophic hiPSCs efficiently fuse with existing muscle fibers following transplantation. Mol Ther. 11, 2153-2167 (2012). Forcales, S. V., et al. Signal-dependent incorporation of MyoD-BAF60c into Brg1-based SWI/SNF chromatin-remodelling complex. Embo J. 31, 301-316 (2012). Albini, S., et al. Epigenetic reprogramming of human embryonic stem cells into skeletal muscle cells and generation of contractile myospheres. Cell Rep. 3, 661-670 (2013). Weintraub, H., et al. Activation of muscle-specific genes in pigment, nerve, fat, liver, and fibroblast cell lines by forced expression of MyoD. Proc Natl Acad Sci U S A. 86, 5434-5438 (1989). Tapscott, S. J., et al. MyoD1: a nuclear phosphoprotein requiring a Myc homology region to convert fibroblasts to myoblasts. Science. 242, 405-411 (1988). Davis, R. L., Weintraub, H., Lassar, A. B. Expression of a single transfected cDNA converts fibroblasts to myoblasts. Cell. 51, 987-1000 (1987). Ho, L., et al. An embryonic stem cell chromatin remodeling complex, esBAF, is essential for embryonic stem cell self-renewal and pluripotency. Proc Natl Acad Sci U S A. 106, 5181-5186 (2009). Gomes, I. C., et al. Analysis of pluripotent stem cells by using cryosections of embryoid bodies. J Vis Exp. (46), (2010). Tiscornia, G., Singer, O., Verma, I. M. Production and purification of lentiviral vectors. Nat Protoc. 1, 241-245 (2006). Barcova, M., Campa, V. M., Mercola, M. Human embryonic stem cell cardiogenesis. Human Stem Cell Manual: a Laboratory Guide. Loring, J. F., Wesselschmidt, R. L., Schwartz, P. H. Elsevier/Academic Press. Amsterdam. 227-237 (2007). Blum, R., Vethantham, V., Bowman, C., Rudnicki, M., Dynlacht, B. D. Genome-wide identification of enhancers in skeletal muscle: the role of MyoD1. Genes Dev. 26, 2763-2779 (2012).